Vignette - a word I didn't use much before this year of daily blogging. The wonderful examples from the hundreds of posts I read weekly inspired me - I started to make 'vignette' displays for my posts. Then I started to put together vignette grouping in my booths. Finally, in the past two months, some vignettes stayed home. 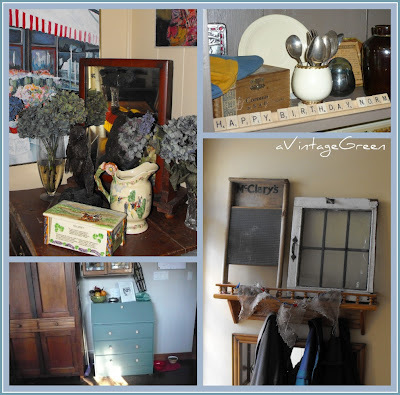 Perhaps this is the beginning of a renewed interest in home decoration or maybe it is just that the 'time' is right for exploring themed groupings of collectibles and then LEAVING the vignettes displayed. I seem to be painting walls and hanging curtains too. Hmm. Usually the pretty nice stuff around the house is just 'there'. Now many groupings 'stay put' for awhile. 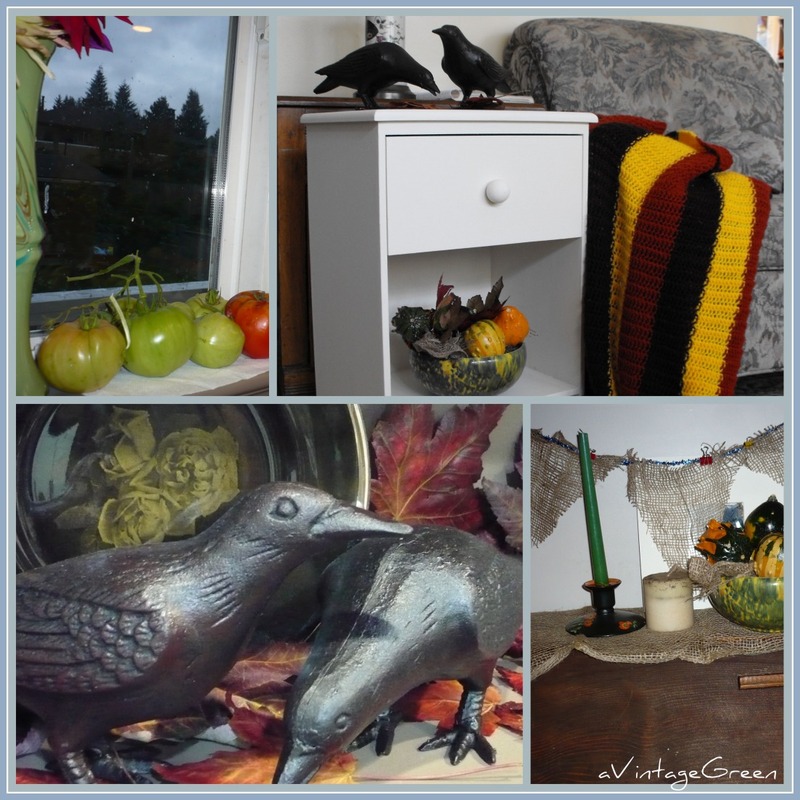 Below I've collected some of my home 'vignettes' and made them in to collages (love Picnik). Here they are; September and October's pretty nice stuff. A couple of similar pictures have been seen in some posts (I notice I take a great abundance different shots of the same items). I have also found that I borrow and move around the groupings to make 'something fresh'. This post seems to have digressed in to photography thoughts. I know that Brenda at A Cozy Little House has had a very positive effect on my renewed interest in photography and composition. Her garden and home vignettes and writings are poetry. Donna at Funky Junk Interiors has also been a prime motivator in 'just do it, learn, try, explore, expand your horizons'. Both bloggers have tweaked a renewed interest in composition, photography and editing, something I loved so many years ago. I am starting to use a tripod whenever possible and researching cameras that include manual settings and multiple lenses while pushing my current digital camera as far as I can. Positive influences are also coming from my sister-in-law's and my sister, all very experienced photographer's, as well as several nieces and nephews now that I think about it - a very talented group. love your vignettes, Joy. 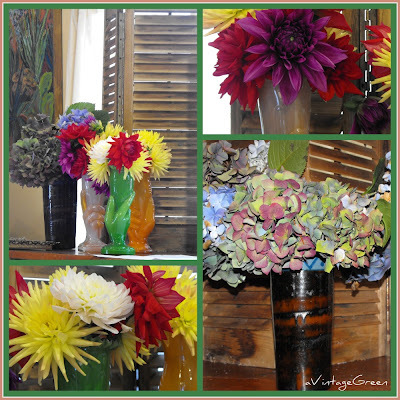 My favourite today is the dahlias and tomatoes with the side sunlight coming in. I also like the larger photos on their own, rather than the little photos (4 to a frame), because I can see more detail in them. I love the window with the washboard the best! Your vignettes are all terrific. I adore the one with the window and washboard. And I too plan to get a tripod! 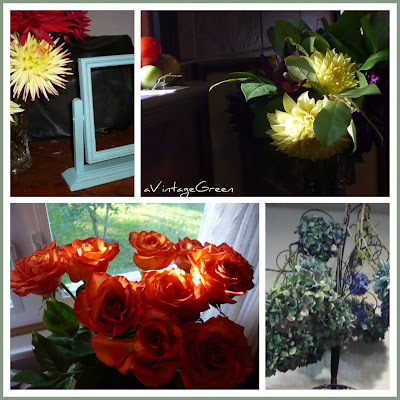 Thanks for linking this pretty post to Potpourri Friday! Very nice! Thank you for linking it to Home Sweet Home!